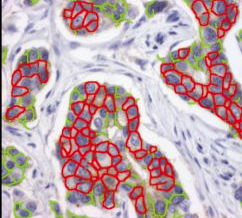 ImmunoMembrane is an ImageJ plugin for assessing HER2 immunohistochemistry, described in [bib]2472[/bib]. It is important to read the URL documentation and original paper to understand how to use the plugin appropriately. Note also that the pixel size is not read automatically from the image, but rather the source image scale should be entered into the dialog box - and the image rescaled accordingly prior to analysis. This scale value is the inverse of the value normally found for pixel width and pixel height under Image -> Properties... (i.e. pixel width & height are given in microns per pixel; the dialog box asks for pixels per micron).